Home / Features / Batangas Malls / SM Lipa / Mall Events - SM Lipa / Need a Job? 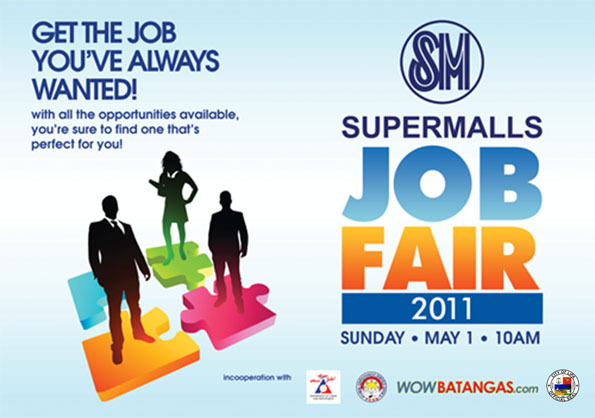 Join the Job Fair 2011 at SM City Lipa on May 1! Are you a fresh graduate looking for your first ever job? Or maybe try out the life in other field of work? Then don’t miss out the JOB FAIR 2011 at SM City Lipa! For years now, the Job Fair transpires on the Labor Day, May 1. So on Sunday, be armed with your resume, wear the appropriate wardrobe, and have enough confidence in searching for your dream job. Don’t just follow your dream, chase it! This Job Fair will happen in other SM Supermalls nationwide. When the mall opens at 10am, be sure to be standing in front of the line and don’t let any opportunity pass you by. We’ll be at SM City Lipa as well for this Job Fair. See you there! Previous Celebrate El Pasubat Festival 2011 in Taal, April 28-30! sna mgkaroon din ng job fair d2 s taal. may bayad po ba ang registration and magkano?